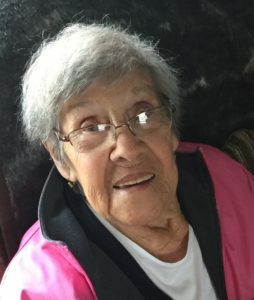 Josephine Jadus, 92, of Oswego died Monday, April 1, 2019, at her daughter and son-in-law’s winter home in NC. Mrs. Jadus was born in Oswego the daughter of the late Cassie and Josephine (LoMenzo) Catalano. She was a former employee of Taggarts Bag Factory, Breneman Hartshorn, Oswego, GE Syracuse, and retired after 31 years with Nestle’s in Fulton as a machinist. She was predeceased by her husband John A. Jadus in 1996 and her son John C. Jadus in 1982. Mrs. Jadus is survived by her daughter and son-in-law Mary Ann & Randall Murray of Henderson, daughter-in-law Patricia Jadus Horsington of FL, her grandchildren John Patrick, Joel, Elizabeth, Adam, Nathan, Matthew, Brian, Daniel, and 14 great-grandchildren. She was predeceased by her siblings Joseph, Andrew, Anthony and George Catalano, and Beatrice Denny. Funeral services will be Monday, April 8, 2019, at 11:00 A.M. at the Sugar & Scanlon Funeral Home, Oswego. Entombment will be in All Saints Mausoleum. Calling hours will be prior to the service from 10:00 to 11:00 at the funeral home 147 W. 4th. St., Oswego. Hello Maryan I don’t know how I came across this but I did this is Carl gerace from Buffalo New York Veronica Catalano nephew the son of rose gerace. It’s been so many years but I wanted to say I’m so very sorry for your loss of your mother.